AINE, H. Roux and L. Barre. Herculanum Et Pompei Recueil General Des Peintures, Bronzes, Mosaiques, etc. Decouverts Jusqu'a Ce Jour, Et Reproduits D'Apres Le Antichita Di Ercolano, Il Museo Borbonico Et Tous Les Ovrages Analogues Augmente De Sujets Inedits Graves Au Train Sur Cuivre Par H. Roux Aine. Paris: Librarie De Firmin Didot Freres,	1870-1872. In eight volumes. Later edition. Tall 8vo., contemporary red half morocco, marble boards, raised bands, single gilt decoration in the compartments. Bookplate, a touch of rubbing but still a near fine set which includes volume 8 which is frequently lacking. History of the Later Roman Commonwealth, From the End of the Second Punic War to the Death of Julius Caesar; And of the Reign of Augustus: With Life of Trajan. London: B. Fellowes; F. and J. Rivington......	1845. In two volumes. First edition. Tall 8vo., orig. green blindstamped cloth, viii, (544); (iv), 476pp. 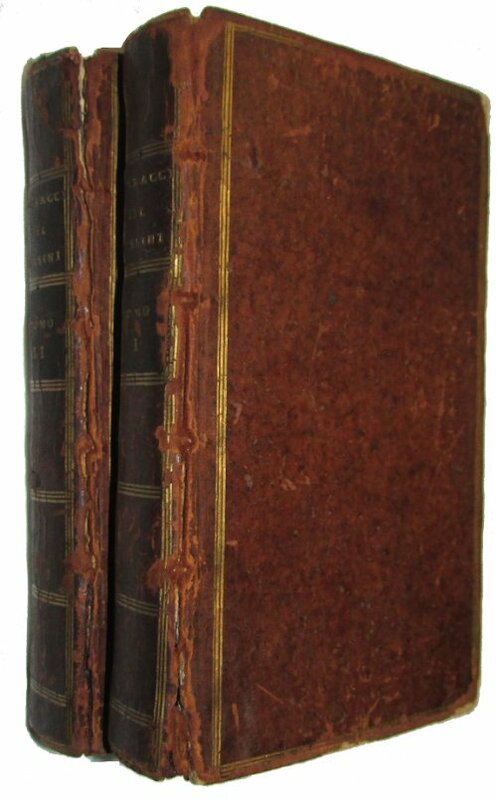 This copy is an ex-library with a new front free e/paper in one volume, the name of the institution stamped in gilt on the rear board, discreet number on titlepages, and a faint mark at the foot of the spines from labels but it is in fact a near fine set in the original cloth. Italy Handbook for Travellers by....Second Part: Central Italy and Rome. Leipzig: Karl Baedeker...	1904. Fourteenth Revised Edition. Sm.8vo. orig. red flexible cloth, lxxvi, 470pp. Dampstain throughout, a good copy only. Leipzig: Karl Baedeker,	1909. Second edition. Sm.8vo., orig. red cloth, xl, 488pp. Name on e/paper o/w fine. Italy Handbook for Travellers by.....First Part: Northern Italy Including Leghorn, Florence, Ravenna, and Routes through Switzerland and Austria with 35 Maps, 40 Plans and a Panorama. Leipsic: Karl Baedeker,	1906. Thirteenth Remodelled edition. 12mo., orig. red cloth, lxiv, 592pp. Dampstain from the titlepage through xxiv, rear hinges split, a good copy only. Il Gonnella Canti XII Con Gli Argomenti Di Ciascun Canto Di.......A Sua Eccellenza Chiara Pisani. Verona: Per Dionigi Ramanzini Libraio a S. Tomio,	1739. First edition. Sm.4to., full contemporary calf, raised bands, gilt compartments, (4), 280pp. Slight dampstain on lower edge of several leaves not affecting the text, but certainly a very good copy. La Consumazione Del Secolo Poema. Lucca: Presso Francesco Bonsignori,	1793. Two volumes bound in one. "Edizione Seconda" (so stated on titlepage). Tall 8vo., full contemporary vellum, title in ink on spine, (viii), 284; 276, (1)p.errata. Contemporary signature "Antonio Buonamici 1794," some slight scattered foxing in volume one with heavier foxing (browning) to the titlepage and first 12pp. of volume two, small paper label on the spine but certainly a very good copy. Novara: Istituto Geografico de Agostini,	(1955). First edition In English. Sm.4to., cloth, 74pp. text, and 128 black and white illustrations. Bookplate o/w fine in a nice d/w. Venezia: Dalla Tipografia Di Giambattista Merlo,	1856. Tall 8vo., orig. printed wrappers, 32pp. Bookplate, small tape repair to top of the spine o/w very good. 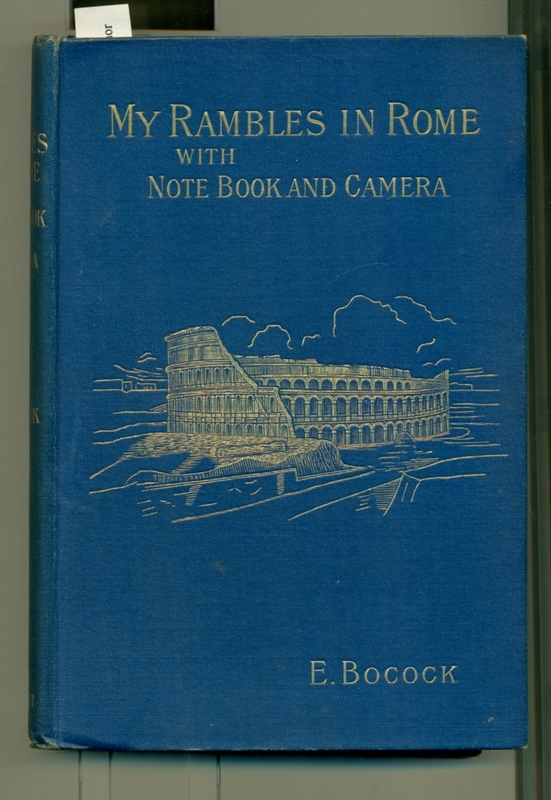 My Rambles In Rome With Note-Book and Camera. London: Robert Bryant, 1904. First edition. 8vo., orig. blue cloth with pictorial decoration in gilt, 272pp. Some minor foxing o/w a fine copy. The Cathedrals and Churches of Italy. London: T. Werner Laurie,	1926. First edition. 4to., orig. blue cloth with gilt decoration, viii, (400)pp. Some light wear to the spine ends but certainly very good. Bibli: Tragedia Del Conte.....Di Modana Accademico Ducale. Modena: Preso La Societa Tipografica,	1774. First edition. 4to., cont. flexible marble paper boards, handwritten label on the spine, 148, (1)p.errata. Spine faded with some rubbing o/w a near fine, clean copy with wide margins. Old Rome and New Italy. By....Translated by Mrs. Arthur Arnold. New York: Harper & Brothers,	1873. First edition in English. 8vo., orig. rust cloth, (viii), (9)-(302), 8pp.ads. Name on title, a bit of wear to spine ends, a better than very good but not near fine copy. New York: Harper & Brothers,	1876. Later edition. 8vo., orig. rust cloth, (viii), (9)-(302), 8pp.ads. Name on halftitle, some chipping to spine ends o/w very good. Old Rome and New Italy. Recuerdos De Italia.....Translated by Mrs. Arthur Arnold. London: Tinsley Brothers,	1873. First edition in English. Tall 8vo., orig. dec. rust cloth, vi, 352pp. About fine. La Firenze Poema Di......Divisio In IX. Canti Cogli Argomenti Di Donileo Eginetico. Ferrara: Per Giuseppe Rinaldi,	1777. Later edition. (first published 1615, there was also an edition in 1628). With the bookplate of Stillman Drake. 12mo., full cont. calf, 147, (1)pp. Ink name on front blank, worm holes in rear blanks and the last leaf not affecting the text, binding rubbed with wear to extremities, a good copy. Gabriello Chiabrera [1552-1638] Italian poet. Along with Marini, Chiabrera is one of the greatest lyric poets of that century. Chiabrera especially was a devoted student of Greek and is often called the Italian Pindar. But he also used the French poet Ronsard as a model. "He used to say that he strove to follow Columbus in discovering a new world, a new world of poetry, as a reaction against the conventionalities of Petrachism and the degenerated taste of the century." "On the whole, his poems are marked by splendid epithets, beautiful images , grace of form, richness of rhyme....."
Rome The Eternal City Its Religions, Monuments, Literature, and Art. Boston: Dana Estes and Company,	(1896). In two volumes. First edition. 8vo., orig. decorated red cloth, xi, 422; vii, 423-831pp. Spines a bit faded o/w a near fine copy of an attractive book. Londra: (a spurious imprint, probably Paris), Si trova in Parigi appresson Marcello Prault, 1768. In two volumes. First edition. 12mo., full contemporary calf, (xvi), 383; 375pp. Outer hinge of volume II cracked but holding, a very good set. Bartolemmeo Corsini [1606-1673] Italian poet, author of the above comic heroic poem. Salve Venetia Gleanings from Venetian History. With 225 Illustrations by Joseph Pennell. New York: Macmillan Company,	1905. In two volumes. First edition. 8vo., orig. turquoise cloth with decoration in gilt and white on upper cover and with a smaller version of the same on the spines, xii, 517, (4); xii, 441, (4)pp.ads. Bookplate o/w a fine copy. Le Vite Degli Arcadi Illustri....Parte Prima. In Roma: Nella Stamperia di Antonio de' Rossi,	1708. First edition of Part One. (the remaining parts were published in 1710, 1714, 1727 and 1751 respectively). 4to., full contemporary vellum, (20), 222, (10)pp. Vellum somewhat soiled but o/w a near fine copy. Contains short biographies of the following; Francesco Redi, D'Angelo Della Noce, Francesco D'Andrea, Marcello Malpighi, Carlo Maria Maggi, Raffaello Fabbretti, Lorenzo Bellini, Vincenzio Viviani, Antonio Caraccio, Benedetto Menzini, Francesco de Lemene, and Cardinale Enrico Noris.